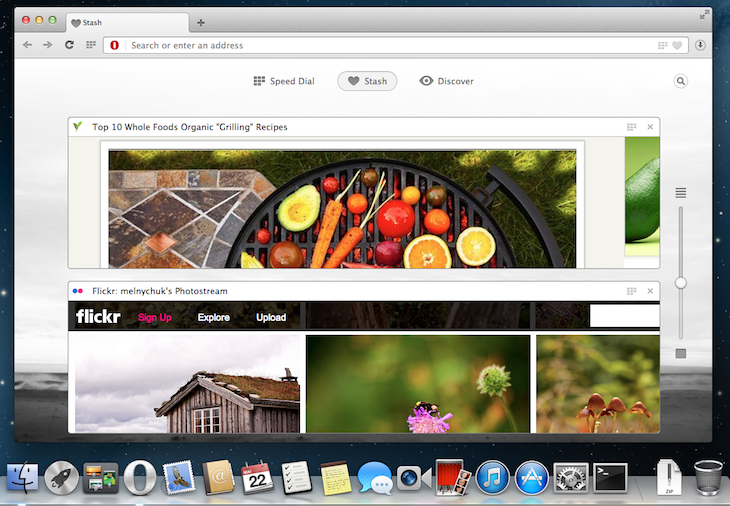 Norway’s chief browser software company, Opera, is offering people a chance to download its latest desktop browser (version 15) for Windows and Mac, which typically happens ahead of a general release. Dubbed Opera Next as per usual, this time the browser was “made from scratch” and given a revamp to offer users a sleeker and easier browsing experience, the company says in a statement. Opera’s Speed Dial start page has been redesigned, as shortcuts to Web pages can be organized in folders and filtered, while the address bar now also serves as a starting point for search queries. Perhaps more importantly, the desktop browser has been equipped with a new feature that we recently saw pop up in Opera’s all-new Android browser: a curated content recommendation system called, simply, ‘Discover’. This feature digs up content that’s supposed to be relevant for users based on their location and a number of pre-set categories such as food, technology and news. Also new is the ‘Stash’ feature, which essentially lets people ‘pin’ items or entire websites for easy reference when shopping, doing homework or any other kind of research. 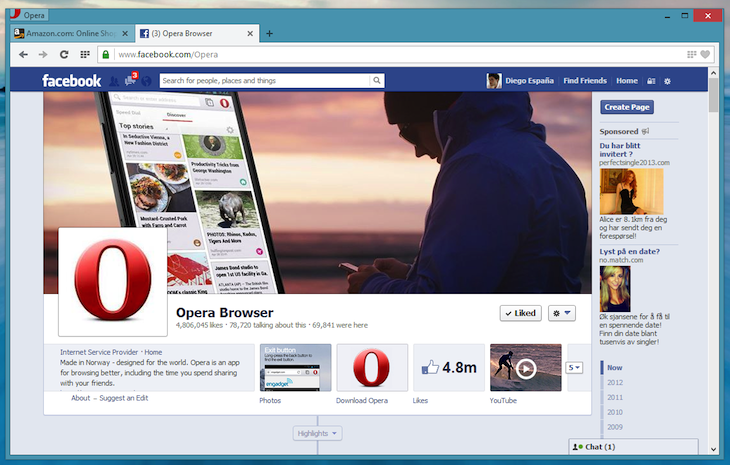 More than a fresh lick of paint and a handful of new (some overdue) features, Opera says the latest generation of its desktop browser has been “completely re-engineered under the hood”, with the most notable change being that it now runs on Chromium – as expected. 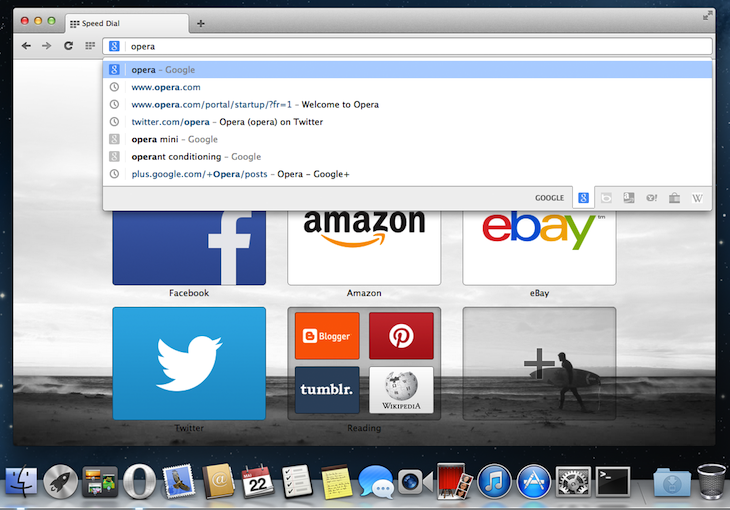 This gives users a standards-compliant and high-performance browser, Opera argues. The browser’s ‘Off-Road’ mode, previously called Opera Turbo, also now supports the open SPDY protocol and thus enables loading Web pages faster than ever. The company has notably decoupled its internal e-mail client from the new desktop browser (“on popular demand”), and has pushed the ‘first release candidate’ of Opera Mail for Windows and Mac – snapshots can be found here at the bottom. Opera’s browser has the smallest market share of the top five desktop browser, but the company has well over 300 million people using its range of mobile and desktop Web browser applications overall. Now that Opera’s desktop browser is based on Chromium, having ditched its own Presto rendering engine first for WebKit and now Blink, there’s a good reason for you to give it a whirl if you haven’t tried it in a while. If you do, let us know how it stacks up to your browser of choice.